Are you surprised that reason thinks little of faith? Reason thinks it ludicrous that faith should be the foremost service any person can render unto God. 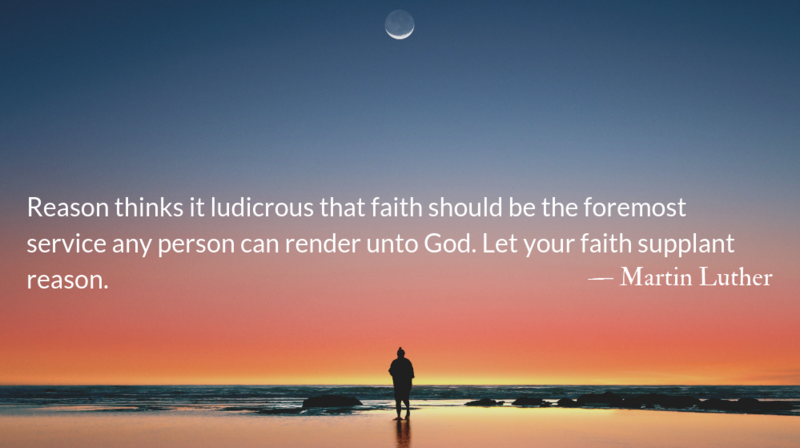 Let your faith supplant reason. Abraham mastered reason by faith in the Word of God. Not as though reason ever yields meekly. It put up a fight against the faith of Abraham. Reason protested that it was absurd to think that Sarah who was ninety years old and barren by nature, should give birth to a son. But faith won the victory and routed reason, that ugly beast and enemy of God. Everyone who by faith slays reason, the world’s biggest monster, renders God a real service, a better service than the religions of all races and all the drudgery of meritorious monks can render. Christian righteousness is the confidence of the heart in God through Christ Jesus. Such confidence is accounted righteousness for Christ’s sake. Two things make for Christian righteousness: Faith in Christ, which is a gift of God; and God’s acceptance of this imperfect faith of ours for perfect righteousness. Because of my faith in Christ, God overlooks my distrust, the unwillingness of my spirit, my many other sins. Because the shadow of Christ’s wing covers me I have no fear that God will cover all my sins and take my imperfections for perfect righteousness. One reason faith is so difficult for today’s culture is that we devalue humility. And faith cannot exist without humility.